Part I. The Big Picture – A history and overview of digital citizenship; how to approach digital citizenship from a policy perspective. This week begins consideration of Part I. Watch this week’s screencast. It will orient you to this week’s materials in about 5 minutes. What is the nature of the evolution of ISTE’s digital citizenship standards? How does understanding its evolution help us understand and plan for its future? How can it help us address the future issues that await us in this area? To identify and explain how educational technology “version 2.0” evolved. To identify and explain how educational technology “version 3.0” evolved. To explain how ISTE standards changed in relation to technology use in education. To apply the ISTE refresh standards (Version 2) and the most recent standards (2016, 2017) to helping students understand the digital lifestyles they lead. The term citizenship has a long and illustrious history…Yet, we wonder whether our notion of citizenship accurately reflects our current needs. After all, a new perspective of citizenship has entered the public narrative that feels so different that we have given it its own name: digital citizenship. This term arises from the need to reconsider who we are in light of the globally connected infosphere in which we find ourselves. That is, given that citizenship seems to be directly related to behavior and social organization, and given that the Digital Age facilitates new kinds of both, we need to update our perspectives about citizenship to provide a more complete picture of who we are. This week we will look at how digital citizenship arose in K12 so that we can better understand the role it is likely to play in a future in which technology and connectivity continue to evolve rapidly and powerfully. in the sidebar on the right. The 2016 version of the teacher standards continues on this trajectory, but with the following significant change: digital citizenship has become simply “citizenship.” As of 2016, it seems the needs of our citizens are no longer distinguished between RL and or online lives. Interestingly, the term “digital citizenship” is retained for the student standards. The 2016 version of the teacher standards also cultivate more specificity. The first of four substandards reads: “Create experiences for learners to make positive, socially responsible contributions and exhibit empathetic behavior online that build relationships and community.” Note the mention of empathy. After a few decades of online interactivity, we have discovered that a lack of empathy – the ability to feel what someone else is feeling – is one of the Achilles heels of online communication. Given the growth of networks between versions 1 and 2, the emphasis on living in a networked world is understandable. But I also think that placing so much emphasis on this misses some key components of the earlier version of the ISTE standards, particularly the notion that we need to come to grips with living side by side with incredibly powerful machines of our own creation. It is just as important that students understand how a microwave oven alters family eating patterns as it is that they understand how social media alters the nature of socializing. So, I have adopted both sets of standards, while focusing on the more current Digital Citizenship standard. New words appear in the refresh standards, including digital, citizenship, culture, and global. (Two other new words figure prominently in the first standard: creativity and innovation, a topic I cover at some length in another book of mine, Digital Storytelling in the Classroom.) I was prepared for this. I conducted one of the earliest studies of an online educational community, and helped develop very early online courses and programs that used nothing other and slow email and conventional postal mail. I have been at it ever since. As a “cyber anthropologist” I was always observing networked behavior. Our interest in digital citizenship is a natural extension of living in a globally networked culture. will version 4 look like? It is our general interest in online anthropology, and cyber behavior, that will help us see more clearly who we are becoming as we set up communities in virtual space. From this, hopefully we will develop a clearer vision of who we would like to be. Digital citizenship can help us greatly in this regard. A focus on digital citizenship in education will allow us to redefine the educational systems we build in RL (Real Life) and VR (Virtual Reality). Video/audio conference activities: None scheduled. - Chapter Two, Perspectives on Citizenship and Community, pages 40-48. For those using eBooks, this is the section labeled Three Levels of Community of ISTE Standards, which goes until the end of the chapter. An electronic version of the book is available to registered students for free through the UAS library. You need to sign into the UAS library site. If you prefer a paper-based copy, you can get one on Amazon. Scan the most recent ISTE Digital Citizenship standards for teachers. You can find those here. Keep this handy as I use it as the basis for identifying the standards we address each week in this course. Find our discussion for this week at the Google+ Community. Look for my lead post for the week, which will always be a restatement of the week’s essential question. Please post at least one substantive posting about this week’s material, as well as at least three responses to colleagues’ postings. Please always address this question as well: How can you apply what you learned this week to your professional practice? Add resources to your ePortfolio: As always, add resources you have discovered this week (or remembered from previous activities) to your ePortfolio. The goal is to build your ePortfolio into an online professional resource site you can use and build on in the future. 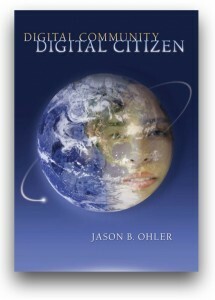 Book cover, Digital Community, Digital Citizen. Ohler, J. Thousand Oaks, CA: Corwin Press. Photo title: Landaff, Grafton County, New Hampshire. 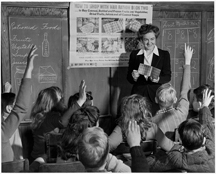 The Blue School teacher is a Massachusetts girl, 03/03/1941.